Improving the payroll and HR experience. Remove the stress from payroll and HR processes. Definitiv is designed to help your business become better engaged with its people. The Definitiv Employee Hub helps your business reduce paper waste and administrative processes. From data entry to approvals, Definitiv utilises automatic workflows, creating a hands-off solution for your payroll, HR and administrative teams. Reduce administration and allow your people to manage their own personal and emergency information. Eliminating double entry of data and freeing up the time of your payroll people, have your people enter their hours directly into Definitiv. 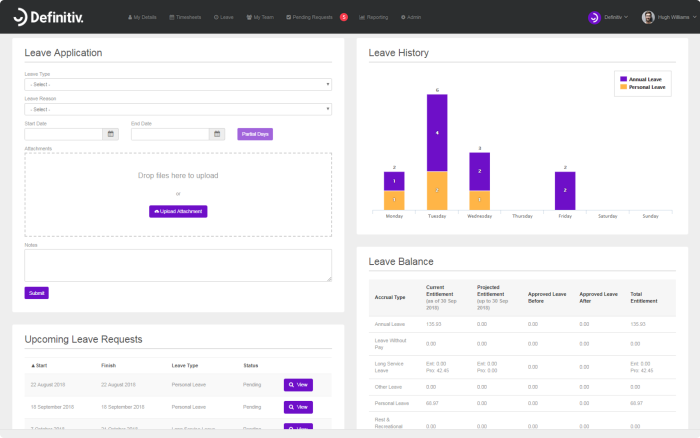 Having your people manage their leave applications directly within Definitiv reduces admin and tracks leave applications and leave history. The easy way for your people to keep you up-to-date on their availability. In Definitiv, your people can select the days, times and dates they’re available for work. Reviewing team members’ leave and hours worked is quick and easy with Definitiv. Managers can approve timesheets and leave applications individually, or in bulk. Definitiv isn’t limited to just your employees. Streamline your organisation by giving access to your volunteers, contractors and relevant third-parties. 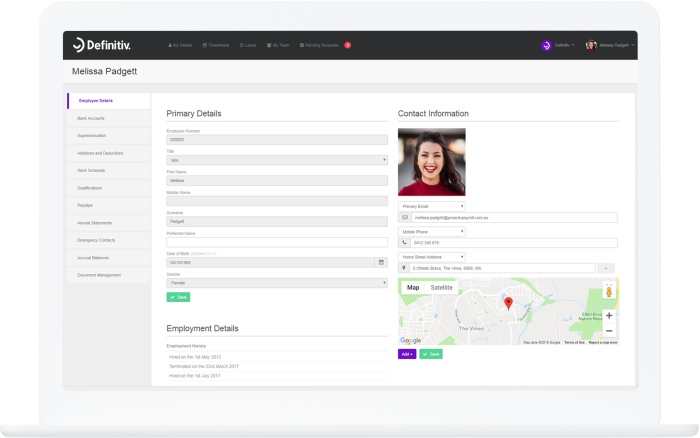 Making your life and the lives of your people easier, Definitiv directly connects your employees to the payroll and HR experience. Creating transparency, Definitiv helps to build trust and efficiencies within your organisation. Paper rosters and manual communications are now a thing of the past. Definitiv delivers instant notifications to your people when their shifts are published, and provides them with real-time access to their upcoming work schedule. While keeping pay information safe and secure, your employees can access their payslips and annual statements when they need them and in their own time. Projecting leave and accrual balances is an automated task within Definitiv. Employees can easily project their future estimated entitlements via the Employee Hub. With Definitiv’s ‘Announcements’ feature, keeping your people updated on company news, as well as changes to internal HR policies, is a breeze. As Definitiv is one comprehensive platform, your people only need one account, regardless of their permissions and roles. The Definitiv mobile app is accessible by your people, regardless of their location. Catering to flexible workforces, the mobile app is available on iOS and Android.